Here are the names of the Grand Theft Auto 4 trophies, and some tips on how you can achieve them. The tips were written based on my ps3 experience but lots of the tips are also relevant to the xbox and pc versions of the game. Packie is the worst at pool so prbably best to play against him if you are having trouble getting this one. This one takes a bit of time but isn’t that hard and QUB3D arcade machines are found all over each of the islands. It will tell you how to play when you have a go and you just have to beat the highscore at the top of the screen. This trophy is bloody difficult! There is also a bit of confusion about over what counts as a melee counter so let me clear that up a bit. A melee counter is where you lock onto a pedestrian target with only your fists equipt. When the other guy takes a swing at you, dodge it by pressing X. You then need to hit him back straight after by pressing circle or triangle – This will do a counter combo sort of thing. Just a few other notes on this one – You can die while doing it and your streak will continue. Say you get 5 counters in 2mins then you die – You then have 2mins to get another 5 from the hospital spawn point. You will have to provoke someone to start fighting you and you can’t melee counter someone with a gun so don’t try! Good locations to do this are the helicopter tours place or near where you start the game at Roman’s taxi place. When you gain brucie as a friend and get his respect you will be able to do races by phoning him up. Win 20 races for this achievement – Most of them are easy but make sure you are in a decent enough car with minimal damage when you get to the start line. You may find that you get this achievement without even noticing. The easiest and best way to do it (ps3 users) is to go to your mobile and select SIXAXIS. While testing the SIXAXIS control of vehicles you will get the chance to do it on a motorbike. Simply position your controller correctly and do a massive wheelie down the airport runway! This is another real tough one to get! Go to the bowling alley and it don’t matter if you chose full game or half game – full game you get more tries if you mess it up. Pick the lane on the left and once there, take two steps to the left. All you have to do now is pull the control stick straight down then push the stick up slowly and in a stright line. This can take some practise and it may help if you use something to move the stick against so you ensure it goes in a straight line. You unlocked the special ability of Roman’s taxi. All you have to do for this one is make Roman like you. You need to get the like pecentage up to around 80% and then Roman will offer you his taxi service. Get the percentage up by taking him out to dinner, for drinks etc often. There are many ways to do this one but its certainly not easy. Most people seem to head for the airport when trying to gain this achievement as there is pleanty of space to build up speed and crash into the various obstacles. There is still a lot of luck involved in this achievement, some may do it first time, other may take thousands of attempts. You may get this by accident when doing the unique stunt jumps so may want to do this one after that. This is fairly easy to achieve and you actually have to do this as in at least one of the main missions you will have a four star wanted rating. There are various ways and I did it by simply watching the minimap and driving down roads with no police cars. You can hide under motorway ramps, use a boat (easier to escape) or try going into your house and saving the game. When you become friends with Little Jacob you will be able to find work from him. Go to Little Jacob in the phonebook and pick “Job”. Complete all 10 of the missions to unlock this trophy. All you have to do for this one is make Little Jacob like you. You need to get the like pecentage up to around 80% and then Little Jacob will offer you his gun service. Get the percentage up by taking him out to dinner, for drinks etc often. For this one, most people head to the central area of the game, grab a bus and block a road or bridge. You let the cars build up behind and rocket launch/grenade your way to victory. You completed the mission “Roman’s Sorrow”. You will do this as part of the main missions. Find a computer and check your e-mail for e-mails from Brucie. Brucie will describe a vehicle he wants and you have to go fetch it for him. Select the “Positive Reply” option on the e-mail. A marker will appear on your minimap where the vehicle is located, just pick it up and take it to Brucie’s garage – The less damage on the vehicle, the more cash you get. Get any type of police car and access the police computer while the vehicle is not moving. Select most wanted, pick a criminal and the marker will appear on your map. Some people moan that they have killed all the most wanted but no trophy/achievement yet. This is because there are 10 criminals on each island to kill and you have to kill all 30 of them! To access the different islands criminals you must use the police computer on each island to see them. Get any type of police car and access the police computer while the vehicle is not moving. Look at the view current crimes section and the easy ones are the ones on foot as you can normally just run them over and there is no car chase involved. If there are no easy ones displayed just restart the police computer and it will display a different set of criminals. Do this 20 times and you have this trophy. You completed the mission “Uncle Vlad”. No tips required – Just complete the Uncle Vlad mission that comes as one of the main missions. You have to unlock all of the islands first to be able to do this trophy/achievement. To the South of the middle island there is a helitours icon on the map – go there and you will see big yellow H markings on the floor where each tour should be. You need to get in each of these helicopters as a passenger for this trophy, do not steal them. You can skip the actual journey once it takes off and this trophy/achievement will still count. Take a ride in all of the helicopters on all of the markings to unlock this – some helicopters may be missing from the markings when you get there but just come back later. You were invited into your girlfriend’s house. You unlocked the special ability of Brucie’s helicopter ride. All you have to do is get Brucie to like you by taking him out etc. Eventually you will unlock the helicopter ride Brucie bonus and will be able to use your mobile to arrange one with him. If you complete all of the main story mission then you should easily get enough cash to get this trophy. There are loads of other ways to make up the money if you are short at the end. You completed the mission “Museum Piece”. No tip really required with this one – Just complete the mission. If you work your way through the main missions then you will eventually unlock all of the island and this trophy. Stevie will send you a MMS showing you a car picture and a location. The location isn’t exact and requires a bit of hunting once you get to the area. The car will always be parked (not driving round) and the bottom right of the screen will tell you what area you are in. Once you get in the right car it will direct you to the garage and you can deliver the car there – remember the less damage the more cash you get! Stevie will send you another text a few hours later for the next car. In Alderney there will be a payphone ringing – answer this to get the assasin missions. You should always come stocked up with armour and weapons but there will be some left near the payphone too once you finish the call. For this trophy/achievement you need to fly under every single bridge on the map. There are 14 in total and its best to use a helicopter – most will not be too difficult but there are some very low ones that may take a few goes. Everytime you fly under a bridge, icons will flash up on the map for a couple of seconds to show the other bridges you still have to fly under. You unlocked the special ability of Packie’s car bomb placement. All you have to do is get Packie to like you by taking him out etc. Eventually you will unlock the car bomb perk and will be able to use your mobile to order this from him. You completed the mission “I’ll Take Her”. No tips required – Just complete this mission as part of the main story. You’ve met all the random characters. When you find a random character in game they will appear as a blue person symbol on your map when you are near them. Go up and talk to them to meet them. Some will give you a mini-mission and other will just chat for a bit. You completed the mission “That Special Someone”. Do this on multiplayer in any of the team games. You can set up a game with people you know to get this trophy easily by just killing them. Very easy, just do a few multiplayer games and you will get this straight away. I am a good driver and my favourite events are the race events but I still didn’t get this for a while. You need to have a lot of skill and a bit of luck as how many times in each race do other people drive into you? Failing this you can do a private race with a mate. You completed “Deal Breaker”, “Hangman’s NOOSE” and “Bomb da Base II” in time. I recommend 3 or 4 players to beat Bomb Da Base in under that time. I’ll separate it into 3 parts: part 1 – stop and get the truck to meeting point. part 2 – fly to the boat. part 3 – plant the bombs. – Part 1: The first part actually should take the longest and requires a bit of luck. Hopefully when you start it’s up the street and not far away. When you get to the truck, ignore the two SUV with the back up. Just start unloading on the truck, shooting from in front of it if you can. Shooting at the drivers even though the glass is bullet proof seems to cause them to stop faster. Once you got the truck, just follow the GPS yellow path, it’s usually the quickest for getting to the meeting point. – Part 2: This is where most people waste time. The fastest way to fly there is over the building. Don’t try the fancy maneuvers between buildings and ****. Just up and over. But don’t waste time going all the way over all the skyscrapers. There are plenty of spaces between them at high altitudes. Now pay attention. The fastest way to proceed is to actually “land” on top of the bridge. You probably won’t end up landing safely and will have to bail out. Just make sure you end up within 1 or 2 stories down from the bridge. – Part 3: This is where you need to split up. One guys should be enough to kill everyone on the top 2 floors (including the bridge) and plant that bomb. The rest should just hop over the railings to get down the ground floor faster. Kill any incoming enemies as you come down. Ignore all enemies from the rest of the ship. Then rush in the main door while going trigger happy, you want to get the drop on them; don’t bottleneck the doorway, just move right into the kitchen and let the whole team get in. You goal is to go through the kitchen and the main room, straight down to the cargo hold. This is where it might get tricky. After the stairs, take out the 1 or 2 guys in the first room, then everyone should just toss grenades through the door. Whoever has armor (remember communication is important) should rush that door to the cargo hold while the rest back him up. The grenades should’ve taken out at least 2-3 guys. After that just rush to the bomb site, but watch out for the rest hiding behind cargo. Toss more grenades if you still have them or shoot the red gas tank in the center, that should knock at least 2 guys out of their hiding places. Lastly, the guy in the bridge should follow after planting that bomb up there. Some enemies in the middle floor (which you guys should’ve skipped comletely) will be going down the cargo hold. What the guy from the bridge should do is catch those so they can’t ambush the team coming up from the cargo hold. Just jump over the side of the ship after planting the bombs, don’t bother going to the ramps. I’ve done this with two other people a few times and at least once finished just about before 5 min 30 sec. Once you get part 2 and 3 down, they become very predictable and systematic. The main variation is where the truck spawns in part 1 and whether the cops will give you alot of trouble. 1. Go for the baggage cart at the beginning, and if you do get it drive to the helicopters. 2. If you don’t get on the cart then shoot as many of the police as you can and ignore the cash drops. 3. By the time one/two of your team is landing the helicopter the other team should have killed enough police for Petrovic to appear. All should be covering the remaining guards while Petrovic get in the chopper. Try and have your seats planned etc and have everyone on board as quick as you can. 4. Don’t worry about careful landings, fly as fast as possible to the evac point, don’t overshoot it. 5. Always go for the crash-landing at the end of the map. With two people one should drive, while the other flies…you both will arrive at about the same time. The Driver should take the car that is outside then drive for the highway (not the backstreet route) and drive off at the end. The flier should run into the garage and grab the car on the left (west) right away and drive it and turn left so it is parked in the garage up against the divider between the 2 doors, this will prop both doors open (this allows you to fly into the garage at the end at high speed to end the mission). Get out and get in the passenger side of the other car to get in the other car the fastest. It takes about 6 extra seconds to park the car and get in the other car, you make more then this up at the end and it only affects the flier at the start. The flier should driver out and make a hard left around the side of the house and head immediately north… toward the back of the house… there is a small wall back there, turn left at the last second and you will jump it… this is a bit tricky and you will land on your roof sometimes… drive north to the first corner turn right and you will approach the house with the heli… grab heli and fly to the site… keep as low as possible…. as you approach the site, fly under the highway and stay low– as you get close, let off the throttle pull back and you will decellerate and rise up high enough to land on the roof quickly. As the driver I usually will work around the N. side of the building, getting everyone on the N. side (there will be quite a few) including all the bad guys you can reach on the 2nd floor from the ground then work up to the 3rd level sweeping each level to collect each card dropped– you should encounter your partner on either the 3rd or 4th floor and be clearing up any stragglers/cards. To have a shot at the time, you have to have the building cleared before the 5 minute point– the faster the better. The flyer should sweep the upper levels with one player then with two as there are always just 7 bad guys on the top 2 levels and all can be reached from the roof (you can shoot the leve 6 guys from the top level– they are always in the same places– when you do shoot down at them, be careful not to miss any packages dropped– these are hard to see some times. Nobody on the 5th (but there is a rocket launcher near the stairs on the east side you might want to grab– there are 2 rocket launchers on the 5th floor and 2 more on the fourth– you need to grab at least 1 of them (picks up 3)– if you die, you get to keep these so don’t waste time picking them up again if this happens- work down to the 4th floor– I normally clear the 4th floor working from the east– as you go down the stairs, stop half way down and you can shoot 4 bad guys from this spot (2 are close to you, 2 are to the west and you will shoot them over the obstructions– there are only 2 other guys on this floor (6 total)– if the driver is a bit slow, go down to level 3 and shoot a few of the stragglers– but give yourself time to head back up top to grab the heli before the last guy and package are clear– if you both have mics, and they are down to 1 package or one guy left to kill– tell them to hold off until you get up to the roof (if you don’t have mics– the “driver” should just wait and listen for the heli blades to start spinning up before doing this– when on the roof, they can pick it up or kill the bad guy and you will have time to get in the heli and fly down to the quay to shoot the boat with the rocket launcher (if you get this spawn)– if you get one of the land spawns– fly to the cut offs immediately land far enough in front that you have time to get out and shoot them– use rockets on the van, AK for the bikers…. The driver should have ran or jumped down to the ground level when the building is clear– you can jump from the 3rd level and survive if you have sufficient health– you can jump from the 2nd without any loss of health. If you get the boat spawn– head to the quay (corner)– get in the heli and spin up the blades as the flyer shoots the boat with the rocket launcher so you can immediately take off when he gets in. If you get one of the land spawns head down to the bikes/cars and drive to the cut offs– you will arrive about the time the flier takes them out and is back in the heli– get in and fly back…. No tips required – Easy enough. This one means winning almost all variations of standard races. You can check which races you have already won using the stats page and going to network. Its difficult as normally you will have to do the race another player sets until you gain control of the race settings. Even when you have the race settings you still have to actually win! Obviously you can use a friend to setup games and take it in turns to win/lose until you have the achievement. Rediculous trophy – you have to win every variation of game which means every race, every level on all teams. You can obviously set up games with friends but it takes a long time. This achievement is awarded if you manage to kill a Rockstar developer…don;t worry though, you can also get it for killing someone who killed someone who killed someone who killed a Rockstar developer. Play a few deathmatches and you should get this without much effort. Easiest way to get the 6 stars is to go onto one of the islands you haven’t unlocked yet, early in the game. Easy ways to survive the 6 stars is to find a place where the police can’t get to you. Hiding under bridges, in buildings or in tunnels. Always use a motor bike unless you happen to find one of the faster cars in the game. Google a stunt jump map you can tick off as you go along. Kill all the pigeons around the map to get this – there are 200 and its easy to miss one even when you are following systematically. Trust me i’m on 199 and ill remain there forever at this rate……… Google a pigeon location map you can tick off as you go along. You get this by hard work and making sure your pals are all happy with you. The 5 are Dwayne, Packie, Little Jacob, Brucie, and Roman – If one of them died in the main mission then you do not have to make them happy and can still get this trophy. All have particulr places they like going, particular times they are available, particular items they like you wearing and particular cars they like to travel in. You can check how happy they ar with you on the stats menu – get them all to like you 90% and you will have this. Answer their calls if they call you and some missions will automatically increase the amount some characters like you so best done later in the game. No tips required – Just complete all the main missions. You need to decide if your going to go for this trophy from the very start, it will change the way you play this game. I decided to go for this trophy and drove everywhere as fast as I could, reloaded failed missions and generally did everything as fast as I could. My mistake was not using the taxis and the “skip” feature to lower time actually playing. Once I realised this makes every journey five times as quick I got this trophy in no time. – Complete every available story mission. — You must unlock all unique abilities from friends. —- You do not need to keep the abilities unlocked, you just have to unlock them all at least once. – Complete every possible activity with each friend. — You must actually BEAT your friends at pool, darts, and bowling. — Dwayne, Michelle, and Roman do NOT count towards the percentage. — NOTE: The achievement for No More Strangers only requires you to meet each random character once, for the percentage, you must complete all parts i.e. Brian Part 1, 2, and 3. — Jeff, Cherise, Clarence, and Ivan do NOT count towards the percentage. Sorry for taking liberties with your time! Platinum Trophy! Get all other trophies! 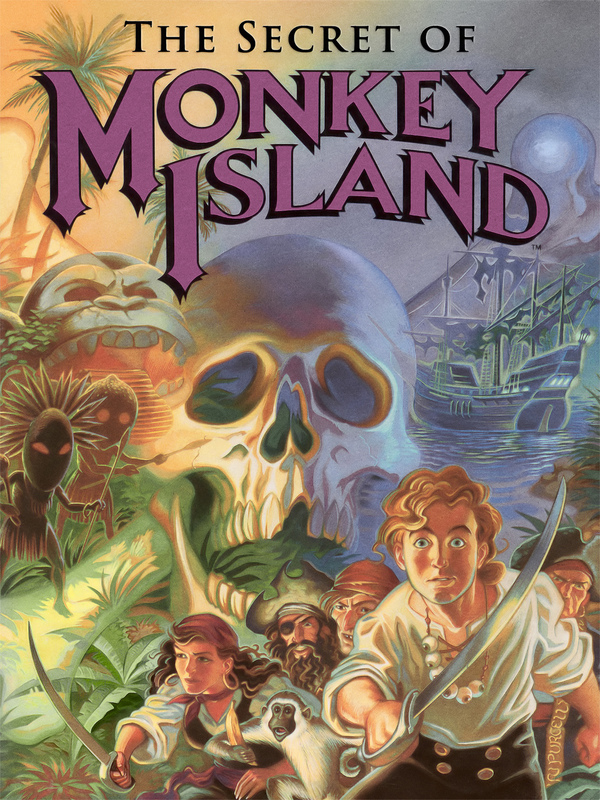 The game begins deep in the Caribbean island of Melee, where a young chap named Guybrush Threepwood wants to be a pirate. He seeks out three Pirate Leaders in the Scumm Bar and they set him three challenges to prove himself a pirate. To prove himself, he must defeat Carla the island’s swordmaster in insult swordfighting, steal a statue from the Governor’s mansion, and find a legendary buried treasure. Along the way he meets several interesting characters, including Stan the used boat salesman, Meathook (a combat trainer with hooks on both hands), a prisoner named Otis, the three men of low moral fiber and, most significantly, the gorgeous Governor Elaine Marley. The ghost pirate LeChuck, however, has been in love with Elaine since his living days. 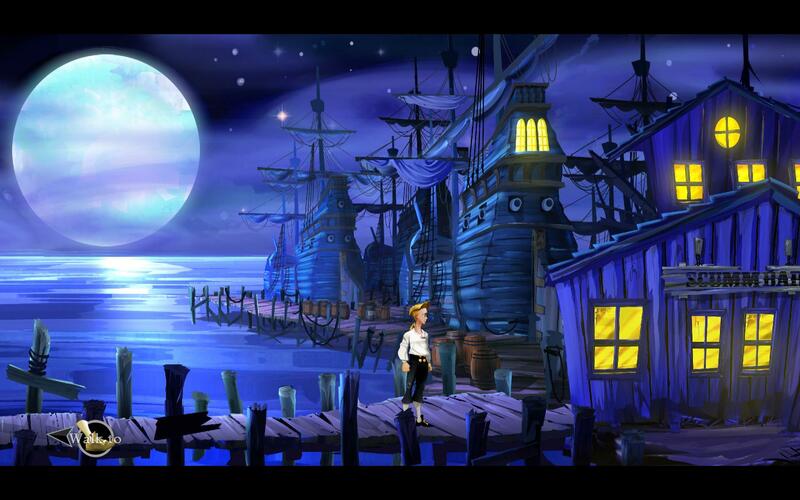 While Guybrush is busy, LeChuck’s ghost crew abduct her, taking her to Monkey Island. 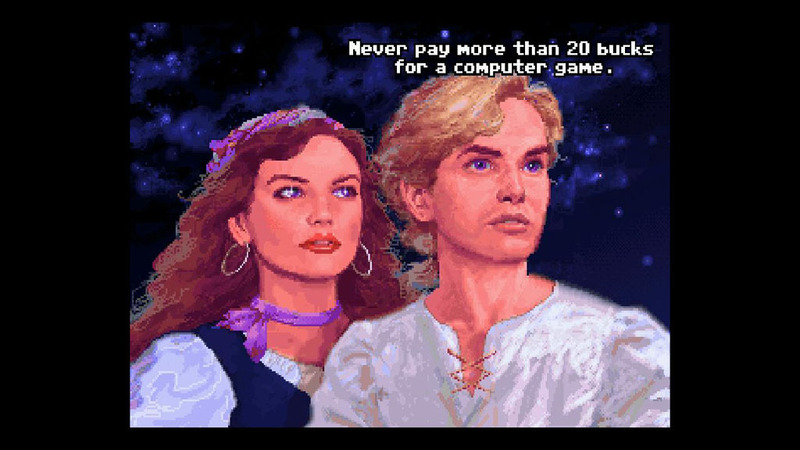 Guybrush gathers a crew (Carla, Meathook, and Otis), buys a boat, and sets out to find the mysterious island and free Elaine. When Guybrush finally reaches Monkey Island, he explores it and discovers a band of cannibals and a strange hermit named Herman Toothrot. After he helps the cannibals recover a lost voodoo ingredient, they provide him with a seltzer bottle filled with voodoo root elixir that can destroy ghosts. 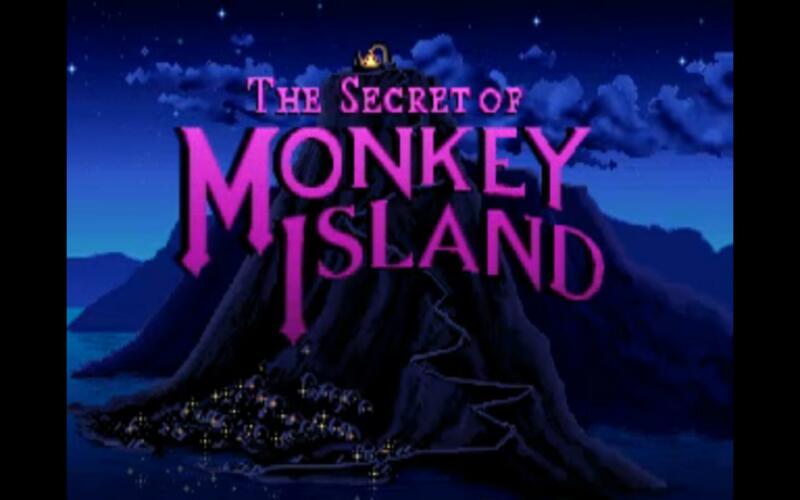 However, when Guybrush goes after LeChuck, he is told that LeChuck went to Melee Island to marry Elaine. Guybrush returns to Melee and goes to the church to prevent the wedding. When he arrives at the church wedding, he realises that Elaine had her own plan to escape. 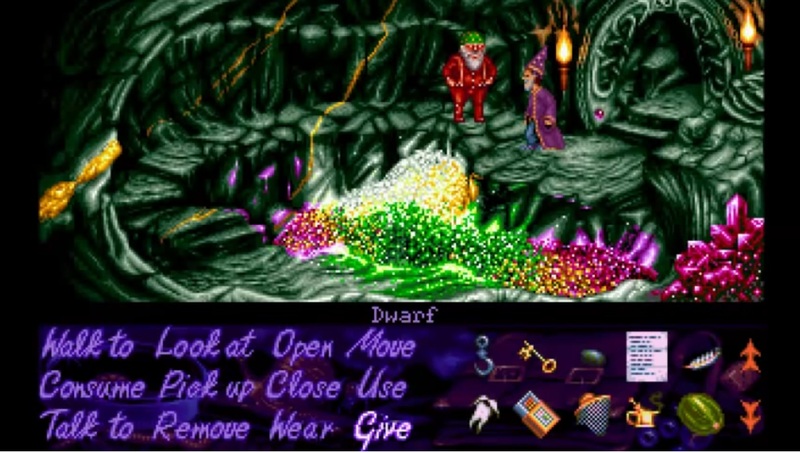 LeChuck starts beating Guybrush; until the arrival at the ship emporium, where he sprays LeChuck with root beer (substituting the magic ghost fighting elixir, which is made from a voodoo root and which Guybrush lost during the fight). 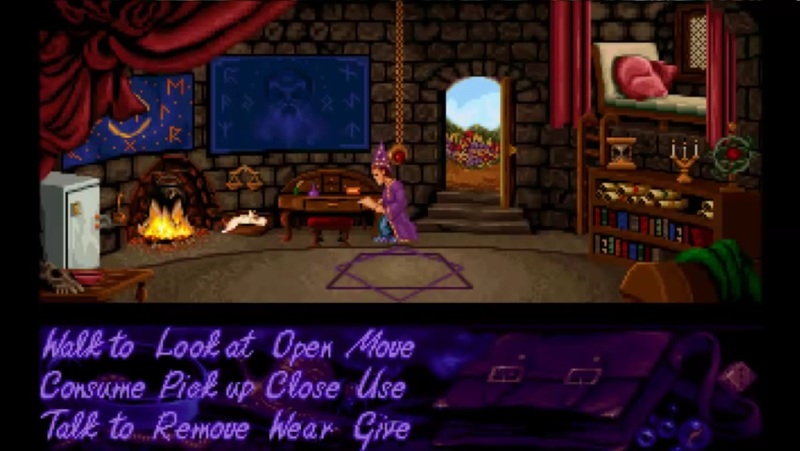 With LeChuck defeated, Guybrush and Elaine enjoy a romantic moment, watching fireworks. What had begun as a straightforward quest to banish the Shapeshifter Witch and free the good wizard Calypso has become hideously strange. Only this morning I was eaten by an amphibian whose table manners were quite apalling. As if that wasn’t a sufficiently inconvenient start to the day, within minutes I was leered at by a rock which refused flatly to say a word. At my wit’s end i consulted with a wise owl. In place of a clue he fed me a red herring. It was delicious but landed me in a pickle. Rather than completing my noble quest I found myself settling an industrial dispute between a despotic Troll and a herd of militant goats. My intuition began to tell me that there might be more to this magic forest than meets the eye. Later, I visited the fiery pit of Rondor (open weekdays and bank holidays 10-6) and considered it truly one of the finest of the thousands of sights man or Swampling could ever behold in this queer land. Sightseeing over, I am determined that tomorrow nothing shall distract me from ending my quest and fulfilling my sacred destiny (weather permitting). Dizzy enjoyed the cruise at first although there were far too many pirates on the ship, the Grog was watered down, and he didn’t even know what a mainbrace was, let alone how to splice it! The captain, Long John Silver, was a lovely old bloke with a kindly manner, good at insulting and degrading the fare paying punters. He was well balanced – he had parrot on one shoulder and a chip on the other – and he had a wooden leg which he acquired when he fell out of his pram when he was a kid. Anyhow, their quaint little man o’ war found itself in still waters one sun-soaked afternoon, and Dizzy thought he would organise a game of cricket on the aft deck. In a fit of blinding stupidity he used LJ’s spare leg collection as makeshift stumps, and when they were lost overboard he was made to walk the plank! Now, just pay the taxman 30 Gold coins and you’ve done it! 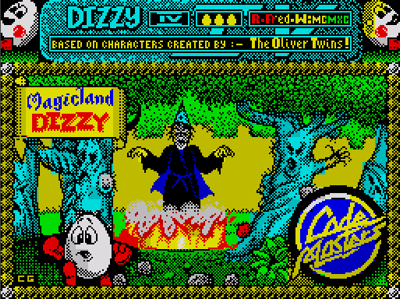 The evil wizard Zaks casts a spell on the Yolkfolk and kidnaps Dizzy’s girlfriend Daisy. 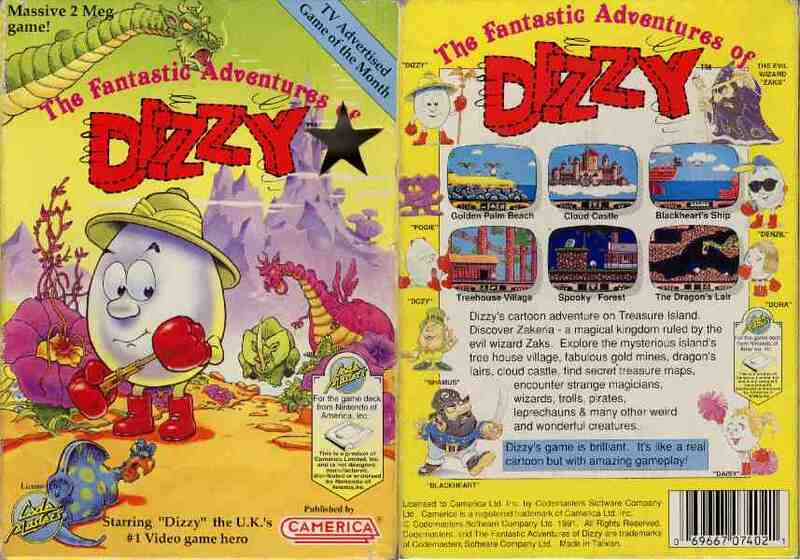 It’s up to Dizzy to undo Zaks’ doings and rescue Daisy from the castle in the clouds. In Dizzy’s hut the door is locked and you will need to open it using the Key which is directly above you when you start the game. Jump onto the dresser and then up on to the rafters. Stand in front of the key and pick it up using the B or 1 button. Now stand in front of the door and put the Key down using the B or 1 button again. Dizzy will open the door. 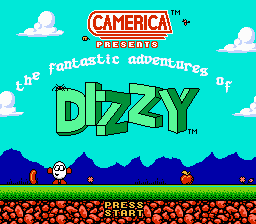 Once doors are open you can make Dizzy go through them by pressing the B or 1 button whilst standing in front of it. If you walk left from Dizzy’s hut you will find a Plank of Wood. The Plank can be placed over the spit of spikes at the base of the tree-house village, just stand on the edge and put it down. To the left of the Ground level Elevator there is an Elevator Key which should be used to operate the Elevator back up to the tree-house. Back in the tree-house to the right of Dizzy’s hut is a Snappy Weed which will not allow you to pass. This can be killed by using a Bottle of Weedkiller which can be found just past the pit of spikes. To the left of the tree-house village there is an Armourog which will attack you unless you give it the Cooked Chicken or Ham found near the Prince. Just stand at the base of the cliff near the Armourog’s den and throw the Chicken by pressing B or 1. Having killed the deadly grabbing plant you will be able to explore far into the tree-house village. Just past the plant you will find the rope which you will need in the tree-house, the Pirate Ship and Zak’s Cloud Castle. Remember, you can only use it where there is a hook. To the left of the Armourog there is a Bag of Gold which can be used to bribe the guard in the tunnel of Keldor Village. As you enter the Village next to Crystal Falls there is an Umbrella which will protect Dizzy from acid drips in the tunnels or mines whenever he is holding it. On Dock Street in the village, there is a Pirate Ship to explore but you must first get past Blackheart the Pirate. You can find a Barrel of Rum by walking far right of the bridge in Bridge Street. There are several objects on the ships which are used later in the game and will be discussed later but remember to take the Rope onto the ship with you as you will need it to swing around the ship’s masts. Daisy’s door Key is just to the left of her hut. Dozy’s door Key is in Daisy’s hut. Dora’s door Key can be found on the left side of the tree-house complex, about halfway up. Dylan’s door Key is to the left of his hut, but you’ll need the rope. Denzil’s door Key is at the base of the tree-house village on a path below Daisy’s hut. Grand Dizzy’s door Key is in the meeting hall above Dizzy’s hut. Dylan, Denzil and Grand Dizzy all have elevators near their huts which must be turned on before they can be operated. Dylan’s elevator Key is very close to his elevator. Denzil’s elevator Key is just left of Dizzy’s hut. Grand Dizzy’s elevator Key is just inside the mine entrance. Remember to examine what keys you have. Nearing the top of the tree-house there is a ledge which is slightly too high to jump onto, it’s the one with the hook at the end of it. Just below this ledge you will find a 1 Ton Weight which can be attached to the hook to pull down the ledge, making it possible to continue up the trees. Dora is at home, but she has been turned into a frog by the Evil Wizard Zak. The spell can only be broken by a kiss from a Prince who is on the Forest Floor. In return for bringing Dora the Frog to him, the Prince will give you a Crossbow which you will need later when you make your assault on Keldor Castle. Dylan can’t catch Pogie the Fluffle, who can be found wandering around the village tree-house. He’s hard to hold, so the only way you can catch him is by placing the Cage over him, this can be found in Daisy’s hut. When you give Pogie to Dylan he gives you a Pygmy Cow which he no longer wants to look after now that he has Pogie back. Denzil was hit by a Freeze Spell while he was out swimming, he has now been brought back to his hut but needs to be thawed out. This can be done by putting the Pile of Straw, which is found near Denzil’s hut, underneath him and lighting it with the Match found to the left of the Leprechaun. When Denzil thaws out he decides that he won’t be doing much swimming any more and so gives you his Flippers. Dozy has fallen into a deep sleep and can only be woken by clashing Cymbals near him. The Cymbals can be found in an underwater cave below the bridge near the mine entrance. To gain access to this cave you will need to cut through the bridge with the axe which can be found at the bottom of the mine, but don’t forget the Aqualung. When Dozy wakes up he gives you his Thick Rug which is used in Zak’s Cloud Castle. Grand Dizzy is ill in bed and needs you to make some medicine for him. The recipe is in his room and you can examine it. You’ll need a Star Plant which can be found just below Grand Dizzy’s hut, the Mushroom which is next to the mine entrance and an Empty Bottle which is also very close to Grand Dizzy’s hut. Throw these three ingredients into the cauldron on Grand Dizzy’s room and then give him the Full Medicine Bottle which comes out of the cauldron. In return for curing him Grand Dizzy will give you a Golden Dragon Egg. Last of all, Daisy must be rescued from the tall tower in Zak’s Cloud Castle at the very end of the game. You will need to have collected all 250 stars from around the game in order to enter Daisy’s prison Tower. The following information will help you with the problems encountered under the sea. On the Pirate Ship, you can swing around the rigging using the Rope and should, with a bit of skill, be able to find a Winch Wheel there. This can be used to open the portcullis of Keldor Castle. If you walk near the plank on the Pirate Ship, Blackheart the Pirate will jump on you from the rigging above and make you walk the plank. This is not quite as bad as it seems because you can use the bubbles to get back to the surface and collect some valuable starts on the way. When you reach the island at the top of the bubble game you will find an Aqualung which will allow you to breath underwater for as long as you like and so explore the sea bed. In the sea you will find an old shipwreck which has an empty treasure chest on it. To the left of the shipwreck is a rock with a bubble below it. Using the Pickaxe which is on the first beach you can remove the rock and gain access to the cave below. But don’t attempt to explore this until you have the Flippers. In the cave there is a Coin and some stars. Use the bubble released from below the rock to raise you to the high ledge and onto the new beach. At the far right of this beach is a cliff which is too high to jump up. To climb this first put down the treasure chest you found on the shipwreck next to the cliff and then jump onto it. You are now high enough to jump up the cliff. As you walk right from the cliff you will find the broken bridge over the Rock Poll, with a dead-wood log sunk in it. If you drop the Bag of Salt, found on the beach, into the water the buoyancy will be increased and the log will float. Walk onto this and jump off the far end, be careful not to roll into the Poisoned water. Between the Rock Pool and the Graveyard you’ll find Shamus the Leprechaun barring your way. He has lost his Golden Shamrock along with his temper! The Golden Shamrock can be found at the back of the Dragons Lair deep in the deserted mines. To reach the dragon and get the Golden Shamrock you will have to go down into the mine. The mine is closed off normally because the elevators don’t work. You can fix the elevator machine by using the Machine Wrench which is found to the right of the bridge near the mine entrance. Work your way deeper into the mine, across the flaming lava pit, until you come across a sign which says “DANGER – Blasting Area”. Put the Sticks of Dynamite, which can be found in the hull of the Pirate Ship, by the pile of rocks and the end of the fuse and then walk back and push the plunger of the detonator. You can now gain access to the Dragons Lair. Things aren’t as easy however as the dragon is a ferocious guardian of its egg at the back of its lair. However if you are carrying the other Golden Dragon Egg which Grand Dizzy gave you the dragon will let you past to put it back. Once you are in the lair put down the egg and take the Golden Shamrock. 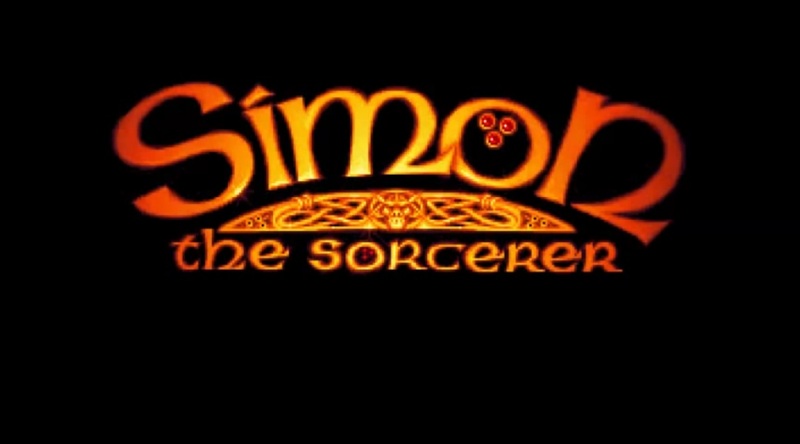 By this stage you will have completed a large part of the game but you will have to contend with Keldor Village and Zak’s Cloud Castle. To eventually gain access to Zak’s Cloud Castle you will need Zak’s Winch Handle. This is in the centre of the Pirate Ship. It is locked into a small room and you’ll need the Crowbar found in Bridge Street to lever the door open. You can enter Keldor Castle by using the Winch Wheel, not Zak’s Winch Handle (that is found in the rigging of the Pirate Ship). Make sure you enter the castle carrying the Crossbow which the Prince gave you. Once you have dealt with the guards and entered the castle you should be able to find a Rope Bridge Kit. This is used in the Graveyard to build a bridge across the gap leading towards the Skull Key which is needed in Zak’s Cloud Castle. In Keldor Village you will have probably noticed a Grave Diggers Spade to the far left of Bridge Street which is too high to get. This can be reached by completing the mine cart game which starts in the mine. This is a difficult part of the game but you should soon learn a route through and collect all the stars. In the centre of the Graveyard you will see a hollow area below the soil. If you use the Grave Diggers Spade here you will gain access to a Secret Cave which has an Empty Bucket in it as well as some valuable stars. When you have the Bucket make sure you go underwater, this will fill it. Remember to examine it to check. To get out of the cave use the trampet found there to propel yourself to the surface. Place it below the opening to the surface and bounce on it. To get to Zak’s Cloud Castle you will need the Pygmy Cow given to you by Dylan. Give this to the Shopkeeper in Castle Street and he will give you a Magic Bean in return. You can plant this in the soil where Shamus the Leprechaun was standing (there’s a sign with a picture of a bean on it). Magically a beanstalk will sprout up into the clouds. Jump onto the leaves and then up into the clouds. You must find a route through the clouds up to Cloud Castle but be careful not to sink through them. Stop every so often and jump straight up as this will put you back to the top of the cloud. When you reach the entrance to Cloud Castle you will need Zak’s Winch Handle which can be found on the Pirate Ship. Once you have used Zak’s Winch Handle and gained access to the Cloud Castle you will find an elevator. Use the Skull Key you found earlier to turn it on. At the top of the elevator there is a Bed of Knives designed to stop intruders. You can get past this obstacle by placing the Thick Rug (given to you by Dozy) over it. Also in Cloud Castle you will find a raging fire which you should put out using the Bucket of Water. Now continue further into the castle, using the Rope to swing to inaccessible areas, collecting all the stars and find Daisy’s prison tower. When you get to the tower door a magical beam blocks your path. This can be disintegrated by collecting 250 stars. Once inside you must climb the tower, defeat Zak and rescue your true love Daisy! Sounds easy doesn’t it! 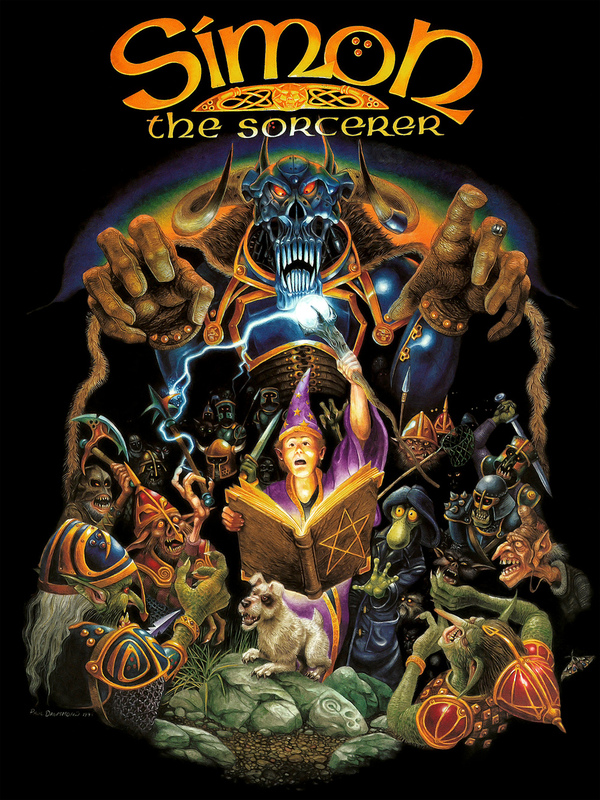 Probably the first one you’ll encounter is Wizard Theo’s Sliding block puzzle. If you can rearrange the blocks to the mystic spell before the egg timer runs out then you will get an extra life. To move a block hold down one of the buttons at the same tame as pressing the direction you want it to move. The secret is to get the corners and sides first followed by the stork. The rest will then fit together easily. Also try to memorise what the picture looks like when you first see it so that you can visualise it when you try to reconstruct it. It may seem difficult at first but after a few attempts you should get the hang of it. If you walk to the far right of the Pirate Ship, Blackheart will catch you and make you walk the plank. Then you’ll have to play The Bubble game. But it will have it’s reward! Always walk off a bubble before it bursts or you will fall through other bubbles for a short time. If you are falling and can see no bubble underneath you can then head for the edge. 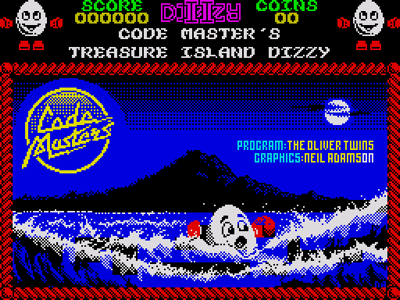 You can make Dizzy swim and hence slow down his fall by repeatedly pressing the jump button. Try to catch fast bubbles as they will take you further. Also remember, the bigger the bubble the longer it lasts! In the deserted Diamond mines of the Yolkfolk to the right of the tree-house village you can find an old mining cart. Jump in and prepare yourself for an exhilarating ride! 1. Brings you back into the mine and is a safer way to get deeper into the mine. 2. Brings you out onto the beach across the bay. If you re-enter this exit you’ll find yourself back in the mine. 3. Brings you out near the Leprechaun and enables you to get an extra life. 4. This exit must be used to get the Grave Diggers Spade. This is a game of memory and you must learn a safe route. Try to memorise where the trolls in carts come from as they will repeat the pattern every time you play the game. In the centre of Keldor Village you will have noticed a portcullis. Behind this lies the Castle of Keldor. This is guarded by rock throwing Trolls. The only way to defeat them, and gain entry into the castle, is by shooting them with your Crossbow. Always enter holding the Crossbow and with room to pick up at least one object. Keep the Crossbow pointing near the centre of the castle as most of the guards appear there and not much movement of the crossbow is required to shoot them. Duck (using the B or 1 button) when the guards throw rocks at you. Shoot the guards by pressing the A or 2 button. Each time you get a hit means you’ll have to shoot another guard to counteract the effect. When you have shot 4 more guards than have made hits on you they will surrender and allow you to enter the castle. When you have solved every problem and collected all 250 stars you will be able to gain entry into Zak’s Tower where he is holding Daisy. To defeat him you will need to turn his evil power against him, but first you’ll have to climb the tower! As you attempt to climb you’ll have to avoid Zak’s evil Tumbling Balls! These come bouncing down, and if they hit you, you’ll lose energy. Watch the ball carefully and try to avoid it. All the sub-games appear more difficult than they really are. You will master all of them with time (and practice!). 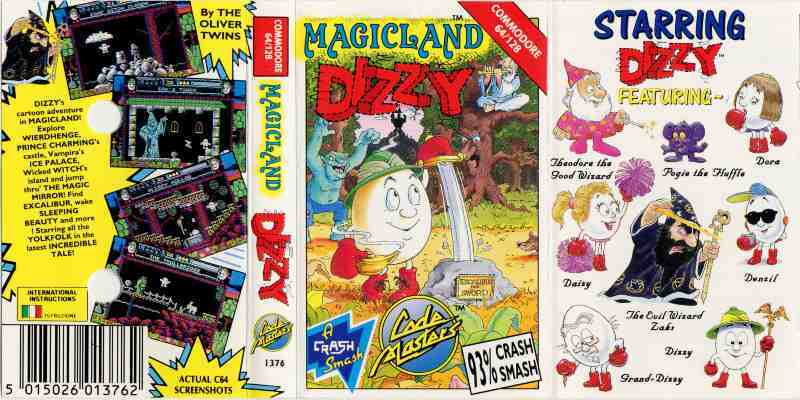 Dizzy’s enemy Zaks, the evil wizard, has returned from the dead and spirited Dizzy’s friends off to Magicland and put each under a spell; Dylan, the hippie, has become a talking bush, Denzil, who thinks he’s so cool, has been frozen in ice, Grand Dizzy, who’s gone a bit senile, is trapped in a backwards mirror world, Dora has been turned into a frog, Dozy’s in an even deeper sleep than usual, and Daisy’s grown too big to escape Zaks’ dungeon. TALK TO THE DEVIL – And thats it! Now find the 30 diamonds and you have completed the game!